This is a follow up post from D is for Dolphins because there was more that I wanted to share about dolphins in Hawaii. Where do dolphins swim around Maui? Where can dolphins be seen? These are not dumb questions, even though dolphins can swim anywhere in the waters of Hawaii. Rumor: dolphins hang out at La Perouse Bay in the early morning, like 6 or 7 am. Ah, one of these days! They also like the waters between Lanai, a nearby island, and Maui. At a Trilogy Blue Aina reef clean up event, we saw them swimming in Honolua Bay, on the far northern section of the West Side (Lahaina, Kapalua). My friend Jennifer, jumped out immediately and swam with them around 11 am that morning. I wanted to share her video but since the privacy is limited on Facebook, and won't show to everybody, here's another short amateur video I found. how to describe the feeling? I was "high" for the rest of the day, and several days later. But the experience, as fleeting and exciting as it was, was also incredibly peaceful and calming. 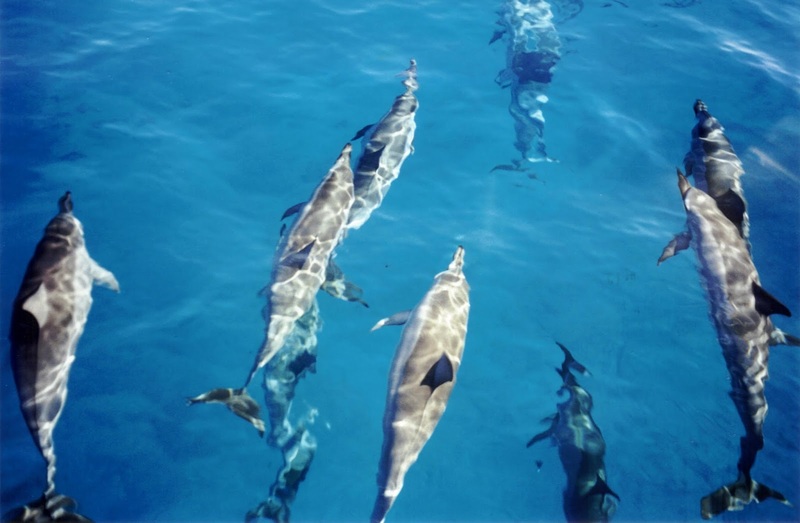 On Oahu, the dolphins used to love Makua Bay on the Waianae side. They would swim back and forth across the bay a few times, like a jogger on her rounds, and then disappear. A friend who was very knowledgeable about the dolphins there, once took me out with her to experience meeting a pod of wild dolphins. They circled around me a few times and it was one of the greatest thrills of my life. It’s rare to see a pod of dolphins swim later in the day, unless they’re near a boat or playing with a whale, but it’s not impossible. Look for groups of curved fins in the water. Also to be clear, this post is not about stalking dolphins. It's about improving the chances of a positive interaction (from a distance) with dolphins in the wild. It's not about helping people harass or disturb dolphins. It's a beautiful experience to see them up close in the wild and one you will remember forever. Also, there are places like Sea Life Park on Oahu which have guided swims with dolphins in their pools. Be prepared to get up early. Be in the water by 6 am. Know which beaches or areas dolphins frequently visit. Some suggestions include the locations above. Swim really fast - fins are a must. A body board is super helpful. It can be very tiring to swim that far out, that fast. The body or boogie board can support your weight if you need to take a break. A snorkeling mask is very helpful too, unless you're a free diver. Watch how the pod of dolphins is swimming. Try to see how quickly they are moving versus how quickly you can move. If you can somehow be in the middle of their path so that they are swimming towards you, you may see them up close. Do not try to outswim dolphins. They are too fast. (Ok, other people may have different experiences, but I'm talking about the average swimmer.) If they are moving fast, you will never be able to catch up to them with fins. Don't splash a lot - dolphins don't seem to like it. Do not try to touch them, keep some distance from them because you don't want to be cited for "harassing" dolphins. Also, it's not polite. Don't make loud noises, like shouting. They may avoid you. Dolphins seem to like children more than adults. If you see dolphins moving towards you, stay quiet, don't move. Let them be curious and want to explore you. If you are part of a snorkeling or boat trip, watch along the rail to see if dolphins show up while the boat is moving. You won't know if dolphins will be where you're going, but with any luck, there will be some. There will be lots of other people in the water, so watch where you're swimming. You don't want to knock out other people with your fins, and if you clump with other people, dolphins may be more interested in visiting the lone swimmer than the big herd of humans splashing in the water. This is another short video (2 minutes) of the dolphins we saw along the boat on the way back from the Trilogy Blue 'Aina reef clean up that day. Here is more info on volunteering for a Blue 'Aina clean up. The more time you spend in the water, the more chance you have of seeing or encountering wild dolphins. Be respectful. Interesting facts on Diolphins. I was trying to comment on your post about the A-Z but I couldn't get to comment. I too have people I want to catch up with even though the Challenge is over. Glad to have met you. Thanks Rebecka, the Liebster nomination is very nice of you... I confess that I have been using May to catch up on the rest of my life after doing the A to Z blog in April so sorry for my delayed response!